Poikilohydric desiccation tolerance enables lichens and bryophytes to survive long periods of water limitation and to recover quickly by rehydration. The evolutionary success of this strategy is reflected by the fact that cryptogams inhabit almost all terrestrial habitats from the tropics to cold and hot deserts. As ecosystem components, lichens and bryophytes may considerably impact the surrounding environment through frequent desiccation–rewetting cycles. What are the differences in mechanism and functioning to successfully compete with vascular plants in many micro-sites and habitats? 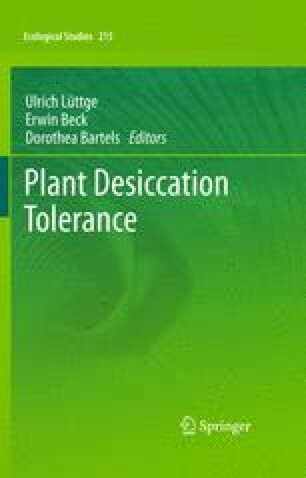 This chapter reviews key issues of cryptogamic desiccation tolerance with particular emphasis on the following aspects: (1) Comparison of mechanisms and processes of water exchange. (2) Function and impacts of micro-scale fluxes to illustrate the effects of desiccation–rewetting cycles on the environment. (3) Global patterns of lichens and bryophytes as an indication for their ecological relevance.